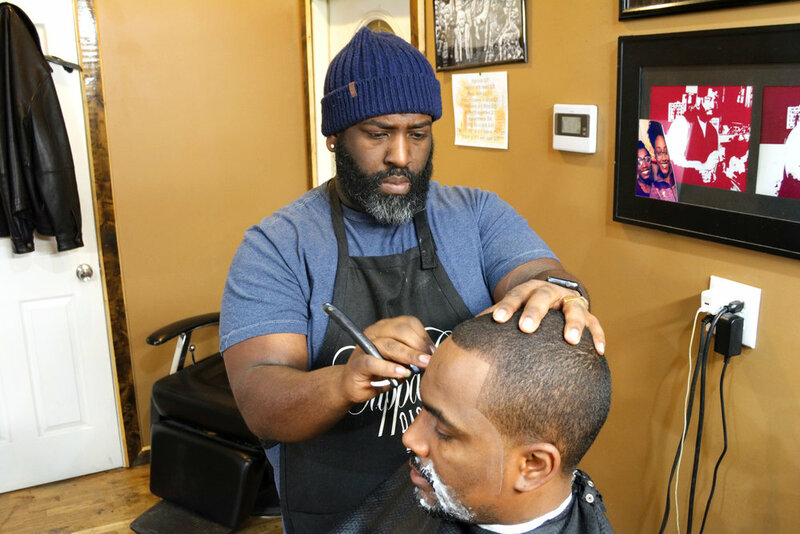 "My defining moment in wanting to become a barber is when I was taking my daughter’s mom to her house and we rode past a barber shop. It belonged to this well known barber named Big Don. He was working at the time and it was sold out. He had the nicest car in the parking lot. That steered me into thinking that I could make a living with this. So many people miss out on their gifts. I had a gift, dealing with these clippers about 23 years ago. Riding past Haskin's, right across Victory Park did it for me. I think that was the moment I knew that I needed to be in the barber shop. My first week in the shop, I knew I was going to make it. The second week was kinda rough. The first week, I came in at the right time. I started on a Thursday, it was busy. It was a bunch of walk-ins and the shop was on Broadway. That started it for me and let me know that I’m gonna be alright at this. What motivates me is watching younger barbers, that used to be customers, turning into the talked about barber. I’ve had the pleasure to witness that a couple of times. You know, guys that I’ve seen go to barber school and now they’re the household name. That motivates me. I remember walking in here and no one could see my vision. The barber that moved in here with me couldn’t see it either. He was like, ‘Man, we ain’t gonna make no money, right here!’. You can make money anywhere, it’s you. It’s not the location, it’s you. Now, location plays a part on the traffic but once you get a good barber, you don’t want to have to keep traveling around, trying to find somebody else. My service to the community has been positive. There’s been a lot of guys that have come to me for advice. I’ve even came in here needing advice. I’ve cut a lot of prominent people over the years. I ask questions. If I don’t know something, I’m asking questions and a lot of people have helped me. One of the most humbling experiences that I’ve had is when we moved over here. All I had was money to buy the building but not money to renovate the building. My customers all pitched in and helped me in some kind of way. That let me know what kind of impression I had on people. We’ve had guys that would come up in here and picking up sledge hammers to knock out walls because they want to see you back in business. That touched me so deep. Plus, there was 50% of the people in here who were helping and I had never cut their hair. That lets you know that this is more than a business. The happiest moment of life is when my kids came into the world. My happiest moment, pertaining the to barber shop, is when I got to cut Muhammad Ali. That was probably the stand out moment, an honor. But definitely, the happiest moment of my life, hands down, is that I have 4 children and being the first person to hold them. Ain’t no accomplishment greater than that. Don’t give up because failure comes first. The person that fails and gives up will be the failure. It’s gonna be bumps but the key is to get up. I’ll be the first to tell you that it’s been some nights when I didn’t think that it was going to work. Just keep your head and know that God has a plan for you. I think that’s the advice that I can give anybody. It’s going to be bumps but you can’t give up. As long as you got that ‘I won’t be denied’ type of attitude, you’ll be alright. Parents need to step up. Parents gotta start listening to the teacher before they pass judgement. They have to realize that their kid might be an angel but they’re not an angel all the time. I see so many parents that are ready to tear into a grown up over their kid. You think that you’re being a good parent, you’re not. You need to put your kid off to the side and let them see you talk to a teacher and someone of authority. If a kid sees you being disrespectful to another adult , what do you think he’s going to do? Ain’t no more respect. The reason why we have so many young dudes out here being disrespectful is because nobody showed them. No matter what you might think of a person, whether it be the police or someone working at McDonalds, when that respect is lost and you don’t show it, that little one behind you is watching you and doing the same thing. We’re all caught up in our lives and forget that we have these little guys watching and will end up acting just like you. Everybody needs to have an eye. When I was a kid, I cursed a lot. I grew up on Shawnee Terrace and my friends were all in that area. I would change the way I talked because I didn’t want to hear somebody’s parent tell me that I couldn’t come on their porch because they heard me cursing. Now, everybody is just minding their own business and don’t want no parts. You have a lot of people that are spectating and saying ‘I knew that was gonna happen’ and not preventing it before. We need to look out for one another and be nicer to each other.